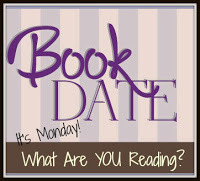 Book By Book: It's Monday 2/5! What Are You Reading? Woohoo! Go Eagles! We live just south of Philadelphia, so everyone around here is going CRAZY over the Eagles first-ever Superbowl win last night. It was an exciting game right up to the last moments. Even better, we enjoyed way too many yummy snacks, and there were some great ads last night - my favorite was the one where Alexa lost her voice & various celebrities subbed for her - hilarious and very clever! My mom and her husband were here for the weekend, so our college sons were home all weekend, and we also had my father-in-law over for the game last night. Now the house is almost quiet again - taking my mom to the train station this afternoon, and then I need to recover from all the noise and excitement! I won't have too much time for recovery, though, because next weekend is Mardi Gras! We can no longer manage the big blow-out parties we used to have with 60 people here, but we still have a small group of close friends come over, and I make some of our favorite New Orleans dishes (we used to live there). Here are some ideas and links for celebrating Mardi Gras, no matter where you live. There's even a link there to live webcams of the parades in New Orleans. Unfortunately, the links to my recipes on that post are no longer working (the magazine I published them in was sold, so they are no longer on the site), but you can see those recipes here, in a copy of the article. Mardi Gras Day this year falls on Tuesday, February 13, so next weekend is a great time to celebrate (in New Orleans, they start celebrating 10 days after Christmas). I just finished a new novel: Speak No Evil, by Uzodinma Iweala, the author of the highly acclaimed Beasts of No Nation. I'm reviewing this one for Shelf Awareness - it's due out on February 6. It is about a top student in DC who is headed for Harvard but can't tell his very conservative Nigerian parents that he's gay. He finally comes out to his best friend, Meredith, but after that, a series of events leads to tragedy. It was an incredibly moving, powerful book touching on so many important issues: tolerance, inclusion, immigration, violence, and more. Don't you love that moment when you get to choose your next book? I have some space in between obligations for reviews and book groups, so I chose a book off our shelves I have been dying to read: The Fold by Peter Clines, a book I bought for my husband for Father's Day at Northshire Bookstore last spring. It's about a new invention that "folds" time and allows teleportation for the first time, but the man sent to investigate it suspects there may be some problems with it that the close-knit scientific team won't admit to. It is already SO good!! I am still listening to the audiobook, The Lines We Cross by Randa Abdel-Fattah, a teen/YA novel set in Australia about a boy named Michael whose parents are strongly anti-immigration. Then he meets Mina, a new girl in school who is a Muslim refugee from Afghanistan, and Michael must decide what side he is on. It is excellent so far and has really kept my attention. My husband, Ken, finished a book I gave him for Christmas, The Last One by Alexandra Oliva. It's about 12 people on a reality show like Survivior, who are out in the wilderness when a real-life disaster hits. They have no idea what's happening in the outside world, and when they see some evidence of the devastation, they assume it's a part of the show. Doesn't that sound like an amazing premise? He really liked it - and it was a pretty quick read. Our son, Jamie, 23, is reading book 5 in the Wheel of Time series by Robert Jordan, The Fires of Heaven. He loves this epic fantasy series! He has several more books in the series at his apartment (he has used almost all of his Christmas gift cards already), but he's not sure yet whether to continue this series or switch to another favorite fantasy series next. Classes for spring semester start today, so his reading time will be cut way back. Last week's blog posts - I finally finished the 2017 wrap-ups, but I STILL haven't signed up for my 2018 challenges! Movie Monday: Blade Runner - yes, the 1982 original starring Harrison Ford! TV Tuesday: Favorite TV Shows Reviewed in 2017 - so many GOOD ones! Lots of goodies for our Superbowl party! We had too many snacks yesterday too, but YAY EAGLES! My husband grew up in the Philadelphia area, so he was extra-thrilled that the Eagles finally brought home the trophy. Go, Birds! It was very exciting (though we did have a few renegades here cheering for the Pats). I am reading Francisco X. Stork's Disappeared, which is pretty good so far. It isn't sucking me in like his other books did though. Sorry to hear that, Heleb! I have always liked his books, too. I read my way through the Wheel of Time series ages ago, it's quite an investment of time and energy, but I feel like Brandon Sanderson really did the Jordan proud by the way her wrapped the series up. My son was just telling me about that this weekend - how Sanderson finished the series after Jordan died. Good to hear those books are just as good & fit well with the rest of the series. He is loving it! I’m glad you enjoyed the Super Bowl and the snacks. I would love to go to a Mardi Gras party someday. Have a great week! Hope that means you got a lot of reading done! Boo, Eagles. BOO! Ha. The goodies look yummy! The Lines We Cross intrigues me! I will add it to my list! Oh, I think you will really love The Lines We Cross - it just gets better and better. I'm not into football, but my son and partner are and are also Philadelphia Eagles fans, so there was some celebrating going on around here on Sunday! I'm a fan of Randa Abdel-Fattah, so I'm looking forward to reading The Lines We Cross. Luckily my library has a copy so all I have to do is carve out some time to read it! The Lines We Cross is excellent - I'm really enjoying it. Hope you do, too! Speak No Evil by Uzodinma Iweala is already on my radar - and really looking forward to finding it. I visited New Orleans sometime in 2009 or 2010 I believe and loved the entire vibe of the place. Yes, that's it - the entire vibe! It's a completely unique place. Hope you enjoy Speak No Evil - so good! I've loved the photographs we see of Mardi Gras. Enjoy the holiday.